Outdoor Lighting Archives | Solved That! RAB Lighting RAB STL360H – Super Stealth 360 sensor with twin precision die cast H101 deluxe shielded Bell floods pre-wired and assembled on universal CU4 EZ plate. Accepts PAR-38 lamps, 150 Watt max. Lamps not supplied. Voltage: 120 volts AC 60 Hz. Surge Protection: Withstands up to 6000 volts. Wall Switch Manual Override: Two flip logic prevents activation by momentary power outages. Override resets to auto at dawn. No extra wiring needed. RF Immunity: Circuits fully shielded for maximum radio frequency immunity. 5 seconds to 12 minutes. Adjustable from 100% to 30%. STL360’s full coverage pattern reduces need for aiming and adjustment. Senses 180° and 360° down for Total Detection. Dark lens with bronze units, white lens with white units. CU4 plate allows the sensor to be mounted under a soffit. Customized press apply lens mask included to reduce coverage easily. WHAT DOES LIGHT BULB COLOR TEMPERATURE MEAN? What does light bulb color temperature mean? That is a great question. My day job has me wearing to different hats as far as job responsibilities are concerned. My primary job is Director of Information Technology but I am also head of facility maintenance and have been for nearly 30 years. In that time frame I have become somewhat of a lighting snob. This also means I am very sensitive to the color temperature of lighting. Just like at the day job I like my home lighting a certain way and color temperature, color rendering index (CRI) and lumens are the key. What does light bulb color temperature mean? It means confusion for consumers. In an office or Industrial environment attention is always or should always be paid to light bulb color temperature. Now home owners and consumers are being forced to do the same. In the old days of incandescent lighting you would simply buy a light bulb based on wattage and the choice of warm white, cool white or daylight. Buyers without much thought would simply match and buy the same bulb style they were replacing. None of this color temperature nonsense. Now in the days of LED bulbs buyers are faced with options of color temperature, lumens, CRI and wattage equivalent. I hear people in Home Depot and Lowes comment “Buying light bulbs shouldn’t be this hard”. Online Q&A’s share the same sentiments. Consumers looking to replace incandescent lights with LED’s should not worry about CRI or even lumens. Your local Home Depot and Lowes wont have enough choices for these details to be a concern in bulb selection. 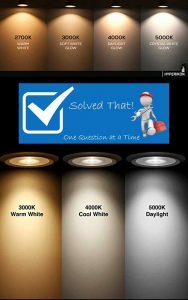 Question – What does light bulb color temperature mean? Answer – Simply put the color of the light you see when you turn on a light bulb. Color temperature is displayed as a number like 2700k which really means 2700 Kelvin. Kelvin is the measurement system used to measure the color temperature of light. All light bulb types and technologies use the same Kelvin system. Incandescent (Tungsten), CFL, Fluorescent, High Pressure Sodium, Metal Halide and of course LED. 2700K-3000K – Warm White – 2700K is the warm yellow light most think of when thinking of a normal light bulb. It’s the light humans have been seeing for millions of years in fire and candle light. 2700K is great all around the house except in the kitchen or task reading light. Use 2700K for a warm cozy light. 3000K is slightly whiter. In LED’s I often find I prefer 3000K. 5000K-6500K – Daylight – Daylight has a blue tint. The higher the temperature the more blue the light. Daylight bulbs are what you often see in grocery stores, hospitals, galleries, museums. It’s a good choice where women are applying make-up and doing their hair. Im often asked what led light bulbs to I use and where do I use them. I hope you find the information useful. Note: I buy nearly all my LED’s online so I can get exactly what I want. Below will be the links to the LED’s I currently use. BR30 Recessed Lights – I really like the Hyperikon BR30 LED Bulb, 9W (65W equivalent), 3000K , Dimmable, Medium Base (E26), UL-Listed bulbs. They are in all my recessed fixtures. Hall Chandelier – I love these vintage looking CRLight 6W Dimmable LED Filament Candle Light Bulb, 2700K, 60W Incandescent Replacement, Candelabra Base, Clear Torpedo Shape Bullet Top bulbs. I also use them in the exterior chandelier that hangs over the front door. Wall Sconces – I use the Philips 433227 10.5 watts 2700K LED Bulb, Slim Style, Dimmable anywhere a bulb wont be visible. They are very light weight, low profile and inexpensive. In fact I give these as gifts. You would be hard pressed to differentiate the color from these and a true incandescent bulb. Bedside Lamps – My bedside lamps use candelabra base bulbs. The SUPERNIGHT 4W Dimmable Filament Candelabra Clear LED Bulbs, 2700K Warm White, E12 Base C35 LED Candle Light Bulb, 40W Incandescent Replacement combined with my Mica shades make for a wonderful warm lighting. 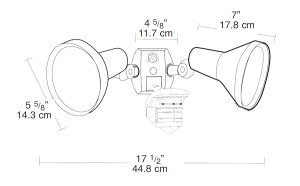 Outdoor Floodlights – The GE Lighting 68181 Energy smart LED 26-Watt (120-watt replacement) 4000K 1650-Lumen PAR38 Dimmable Floodlight is bright and heavy. Make sure your floodlight heads are tight! I would have bought a 3000K bulb but they were not available. Exterior Lights – For general outdoor lighting and in the garage I use Vintage LED Filament Bulb A19, 10W LED Light Bulb, 2700K, 100W Equivalent. These have a vintage looking filament with a standard bulb shape. Post Lamp – CRLight 2700K 10 watt Vintage Style Edison Bulb – This bulb is an extremely bright 100 watt equivalent that adds class to any fixture with an exposed bulb.